One of my favorite places when I lived in Montreal was a bakery called Premiere Moisson. I loved gazing at the perfectly shaped croissants and the chocolatines, flaky beauties with a sliver of dark chocolate that oozed out in each greedy mouthful. There was a huge selection of breads to choose from, including hearty loaves of spelt, whole wheat, sourdough, flaxseed, plus slender multiseed baguettes and walnut loaves (one of my favourites), plenty of bread to put you in a decision-making-frenzy. If I had enough stomach space, I’d buy them all and eat like a queen. 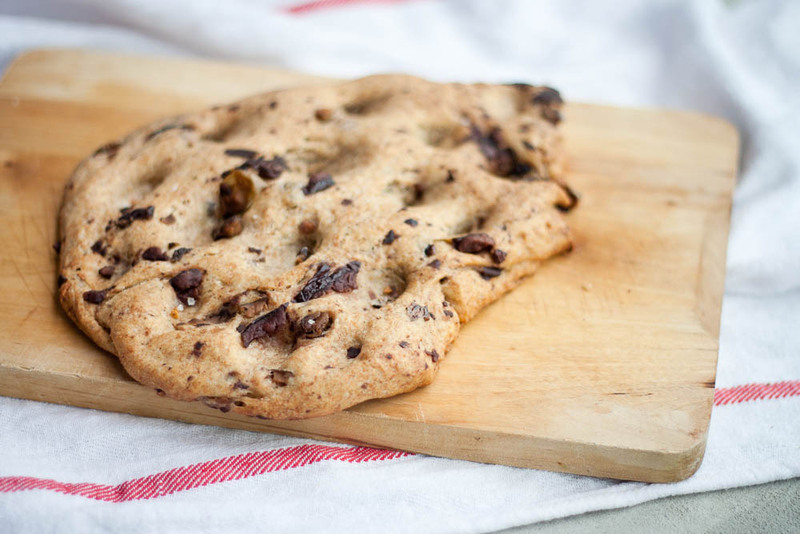 The breads that always caught my attention were the foccacias: bacon and cheese, the sundried tomato, and of course, olive foccacia. Dark purple bits of briney fruit studded in the large, oval bread always makes me swoon (I’m easily smitten, can’t you see?). When I’m in the mood to splurge $4.50 on foccacia that I can finish in less than three days, I do, but other days, I’m much more inclined on making my own. Besides, homemade bread is immensely satisfying. 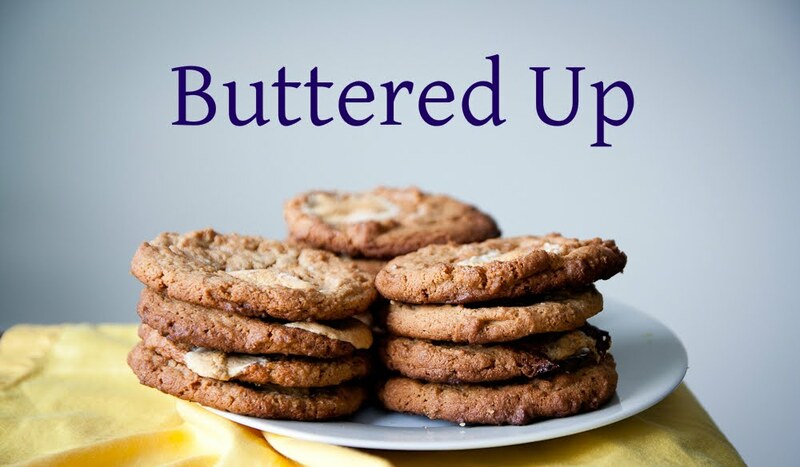 I was hesitant at how this would turn out since I used half all-purpose flour and half spelt flour, but it worked out perfectly, in fact, the best part was mixing the dough in my stand mixer which can be described in one word: easy! (if you don’t have a mixer, using your hands works too, it’s just messier). There’s plenty of olive oil in the bread, making it moister than other foccacias I’ve made. The dough is prepared a day before baking and allowed to rise in the fridge overnight, it’s not necessary, but it strengthens the olive oil’s floral flavour. I’m also a kalamata olive-kinda girl. I find them sweeter and more tolerable than their green counterpart, though you’re free to choose whatever variety you prefer. The best part is within minutes this goes into the oven, a deep, intoxicating scent of salt, olive oil and wheat takes over, nearly stopping you from doing anything else. Next time, I’d make this for a big dinner party and split it with friends, there’s something about fresh bread that is very homey and forgiving. 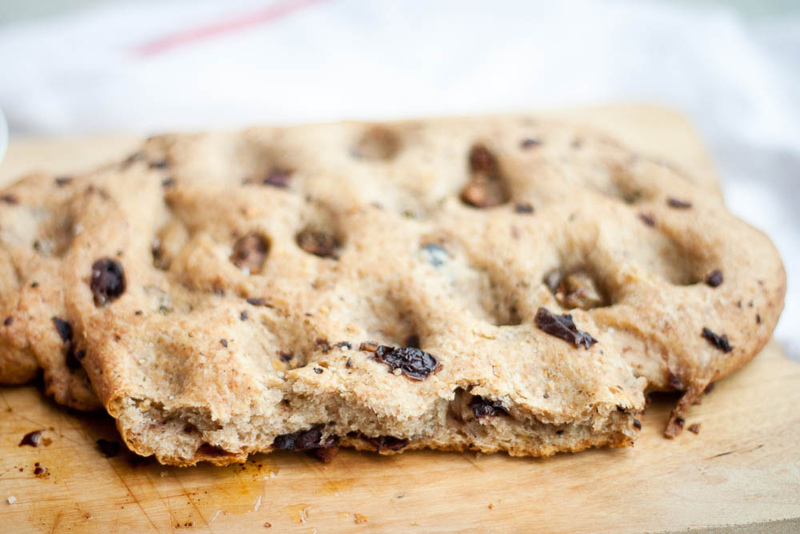 Whenever I make bread at home, I always wonder why I don’t do this more often and once you try this focaccia, you will wonder too. Don’t even think about getting canned olives here, be a snob and get the fat, juicy olives, they have more flavor and meatiness than the former. You will thank me. If you don’t have spelt flour, you can use all-purpose flour instead, it will still taste great. Sprinkle yeast over 1½ cups water (120°F to 130°F), let stand for a few minutes. In the bowl of a stand-mixer, combine flour and salt. 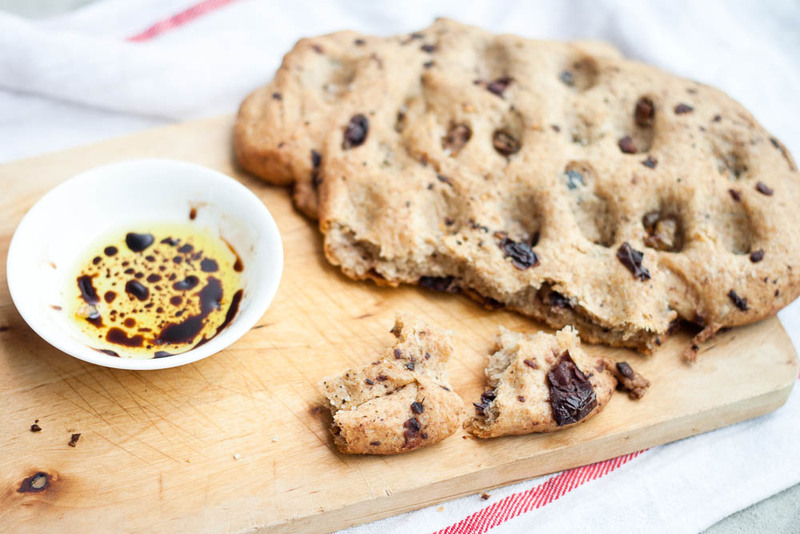 Using the paddle attachment, run the mixer on low speed and drizzle in olive oil until combined with flour. Next, pour in yeast and water mixture and mix until just combined, and the dough comes together in a sticky mass. Warm a non-metal mixing bowl in the microwave until warm. Coat it with a light drizzle of olive oil, and form the dough into a ball. Toss to coat dough in olive oil, then cover the bowl tightly with plastic wrap and set it aside for 1 to 2 hours, or store overnight in the fridge until needed. 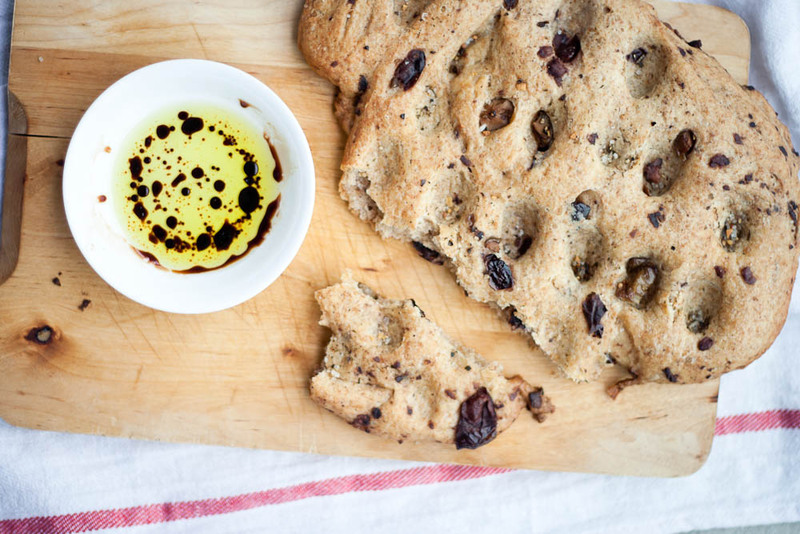 To make the focaccia, blot olives with a paper towel to remove excess moisture. Remove dough from bowl and place on a lightly floured surface. 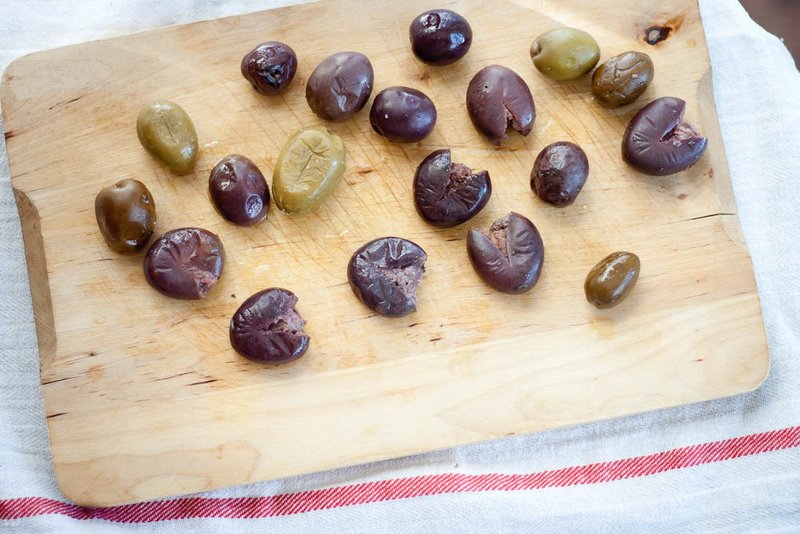 Place chopped olives on top of the dough, then very gently knead the olives into the dough. (Don't overknead!) Divide dough in half and roll each half into a large, thin oval/rectangle. Place on separate sheet pans (or cookie sheets) drizzled with olive oil. Drizzle more olive oil on top of the dough and cover each one with plastic wrap. Put in a draft-free/warm place for one hour. Preheat oven to 400°F. 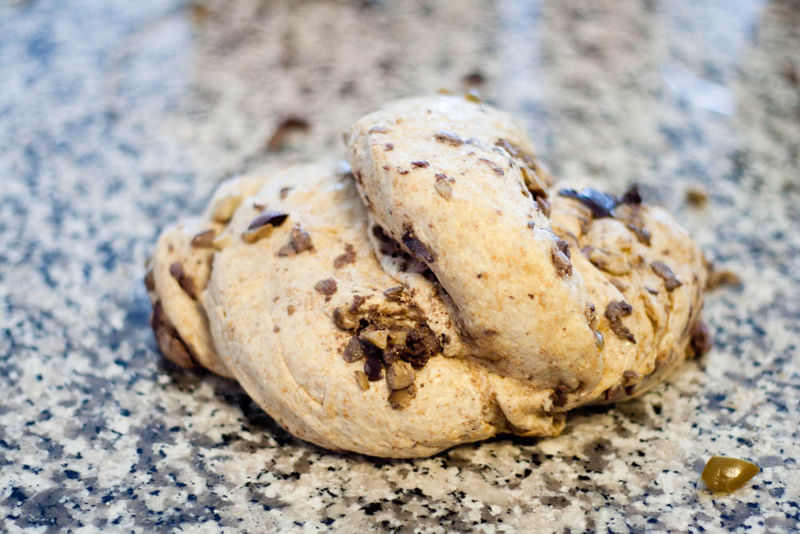 Remove the plastic wrap (dough will be puffy) and use your fingertips to press dimples all over the surface of the dough. Drizzle surface with olive oil and sprinkle with kosher salt. 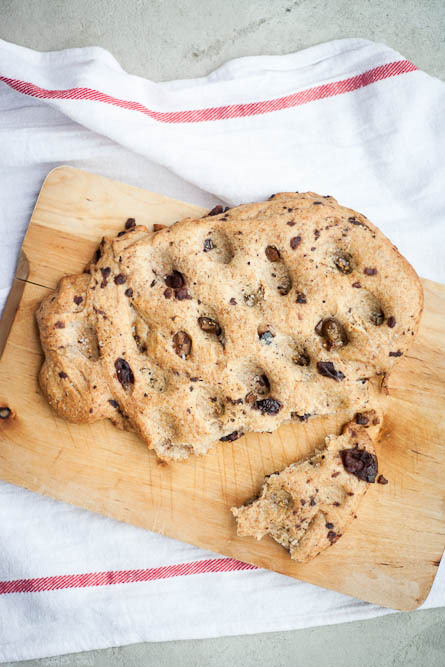 Bake for 30 to 40 minutes, or until focaccia is golden brown. Cut into pieces with a pizza wheel or sharp knife. Serve immediately.